Upstairs at studio/gallery 6 "Cannibal Eyes: Transformational Drawing and Collage" features new collage and drawings by Todd Hale (@flavorhead). Part of an open body of work, "Cannibal Eyes" features work made from an excavation of pop culture and cartoon imagery. The process incorporates video, animation, collage, painting and drawings made on an ipad. On display will be fossils and relics from this on-going exploration, in the form of conjured beings and technicolor visions. 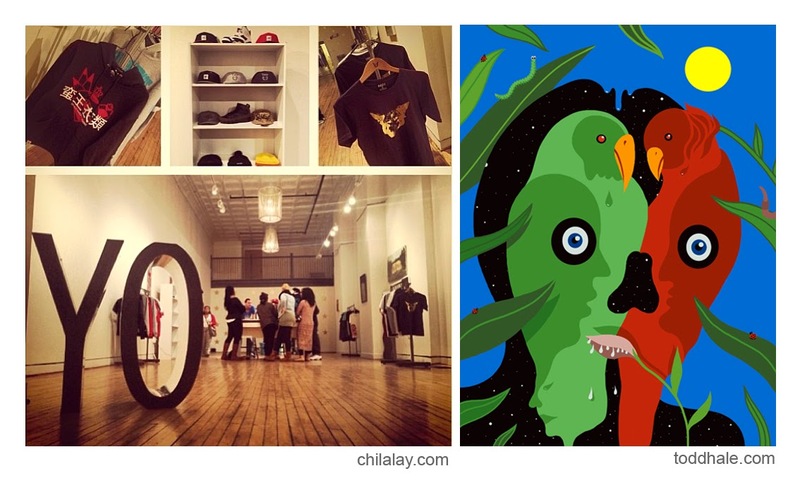 Downstairs Chilalay, a Richmond based collective (@chilalay_), hosts a pop-up art and fashion show featuring multiple artists as well as the work of painter (and the show's curator) Earl Mack (@earl_mack). Live DJs and clothing and merch for sale. Both shows are open from 6pm-10pm, visit toddhale.com and chilalay.com for more information.